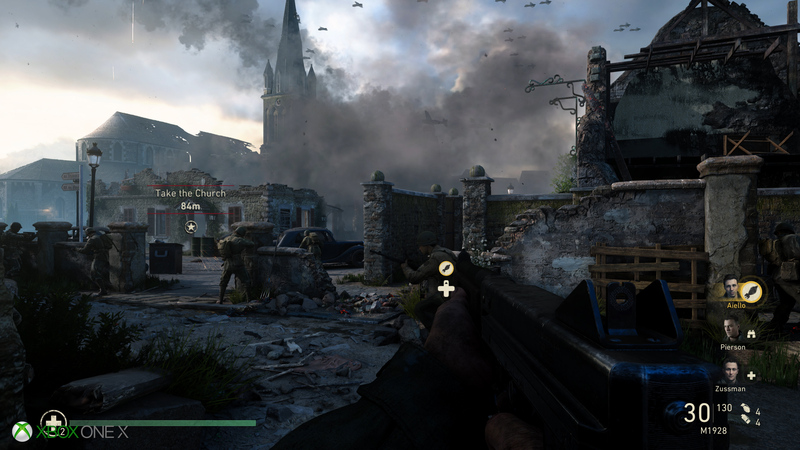 How does Call of Duty: WW2 look on Xbox One X and PS4 Pro? Initial analysis from Digital Foundry. Every year, a new Call of Duty arrives, the franchise standard bearer for 60 frames per second gameplay and by extension, the end product of some of the industry's most talented engineers, miraculously working more effects and features into a minuscule 16.7ms per frame time slice. Based on what we've seen so far, WW2 can stand proud alongside the technological miracle that was last year's Infinite Warfare. Small issues aside, this is another beautiful-looking title, pushing the series on once again without unduly compromising the 60fps lock. To be clear though, this is just a first look at WW2, with an emphasis on the premium console platforms - PS4 Pro and Xbox One. And our focus is limited to the campaign, the area of Call of Duty titles where the linear nature of the experience typically allows the developers to carefully budget resources, pushing the sliders up as far as they can comfortably go. It's in this area of the game where COD typically delivers the most bang for your buck, but it's a world apart from the more freeform multiplayer. Regardless, it's fascinating to see the aesthetic of the game and the core enhancements in technology reflect the series' aim to get back to a more realistic setting. The lighting in WW2 is a massive revamp from what we've seen from the series before, the COD engine (or at least Sledgehammer Games' fork of it) offering up a beautiful, full HDR presentation for the first time. The realism extends to materials too, which fit seamlessly into the scene in all areas. 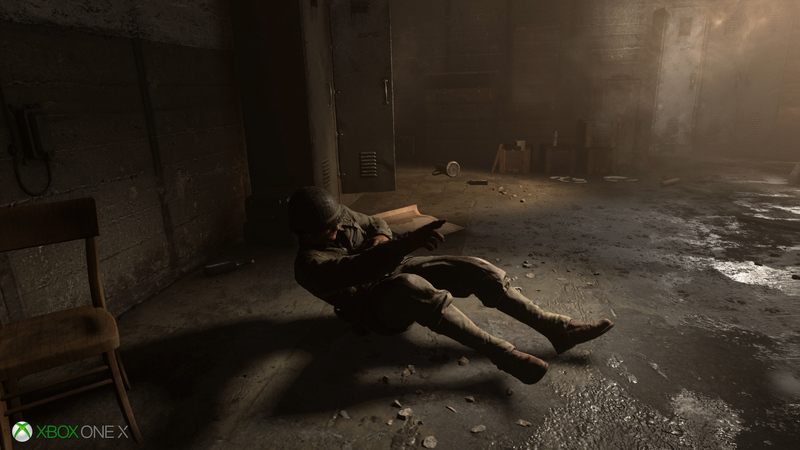 There's also a renewed emphasis on character rendering: WW2 features beautifully realised characters, with remarkably well-realised skin shaders and excellent animation. There's the sense that Sledgehammer may have pulled back slightly from the super-dense post-process approach seen in Infinite Warfare - film grain is pared back a touch, for starters - but there's still the feeling that the developer is aiming for a cinematic look to the title. Similar to many titles we've seen recently, the game employs a heavy temporal component in its anti-aliasing, meaning that the traditional super-rich detail level associated with native rendering in video games is absent. You can call the presentation soft, but by that chalk, the same can be said for any movie or TV show. Like it or not, techniques such as these represent the future of the video game aesthetic. 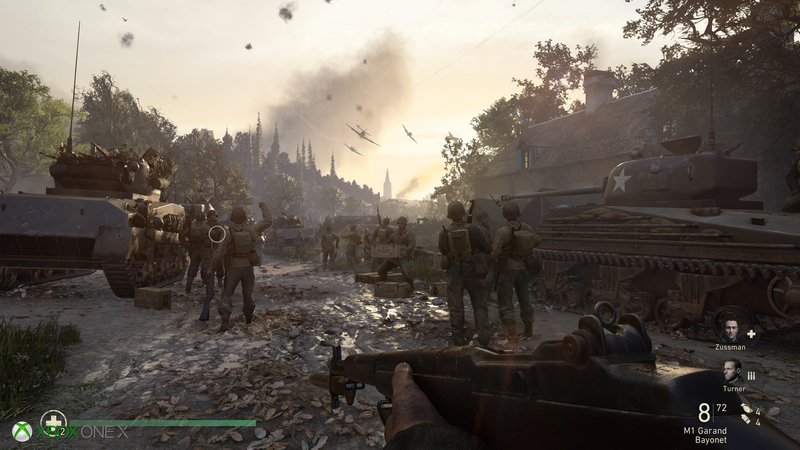 Our first look at Call of Duty WW2, with campaign segments compared on PS4 Pro and Xbox One X. And by extension, that makes pixel-counting - which relies heavily on flat geometric edges - very difficult to deploy on this title. Similar to other games that rely heavily on temporal anti-aliasing, the difference between Xbox One X and PlayStation 4 Pro primarily comes down to clarity. The Microsoft platform does render more pixels more of the time, and this primarily manifests by presenting additional detail in the image. It's no game-changer though - things just look a little clearer for most of the time. 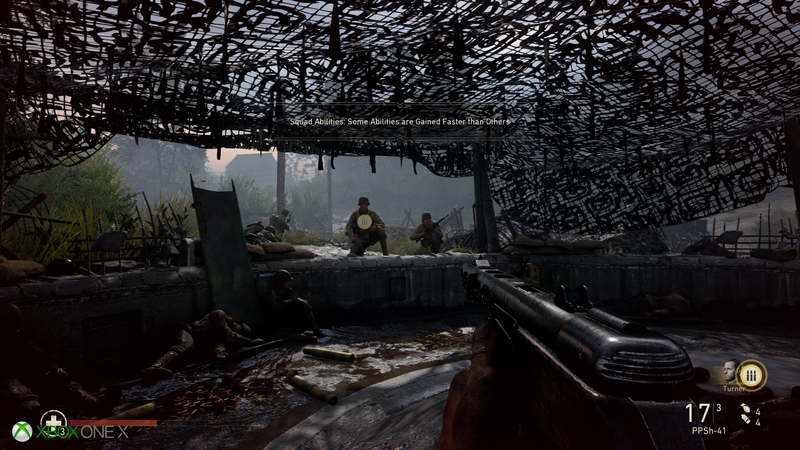 It's early days here, but our impression is that WW2 employs dynamic resolution scaling on both systems, with the lower bounds set at 1920x2160, rising to a full-fat 3840x2160. Perhaps not surprisingly, it's Xbox One X that gets closer to the higher-end of the scale, and the artefacts present in the horizontal upscale (apparent on both systems) are more obviously observed on the Pro presentation. Whether it's a checkerboard-style side effect or a product of temporal upscaling remains to be seen, but we feel there's more work to be done here in how WW2 makes the final resolve pass for 2160p output. The comparison shots below offer up a fairly good indication of how this game presents overall - you won't be getting a super-clean look on either game, and to be fair, that was never Sledgehammer's intent - but Xbox One X offers up more detail overall, and fewer upscaling issues. There are also some bonus extras on top too. Shadow detail is heavily filtered on both systems, but there's clearly more definition on Xbox One X. More subtle still is ambient occlusion - shading in the nooks and crannies, effectively - which again, seems to have been pushed up a notch on the Microsoft system. Dynamic resolution is present across both consoles. PS4 Pro often comes in at 1920x2160, while on Xbox One X resolution regularly hits a full 3840x2160. Image quality is softer on PS4 Pro much of the time, though temporal AA creates a smooth looking presentation on both systems. However, in some scenes horizontal resolution takes a visible hit on Xbox One, with image quality appearing similar to on PS4 Pro. This scene appears a touch more refined on the Pro, for example. Image quality is held back by a dithering effect across the entire image on both consoles. The artefact is more pronounced on PS4 Pro, perhaps due to the lower resolution of this version. Look closely at the wall on the far right. Higher resolution shadows on Xbox One X ensures that these elements appear more defined on the platform. The Microsoft platform also appears to employ more refined ambient occlusion. Effects work appears nicely matched across both consoles, with plenty of alpha-heavy explosions and cool post-processing effects like motion blur and depth of field. All told, the new Call of Duty looks great on a 4K display, with the visual pay-off improved on Xbox One X, but not exactly to a dramatic extent. And in terms of the most important metric of all - performance - both Sony and Microsoft platforms deliver an almost entirely identical turn-out. 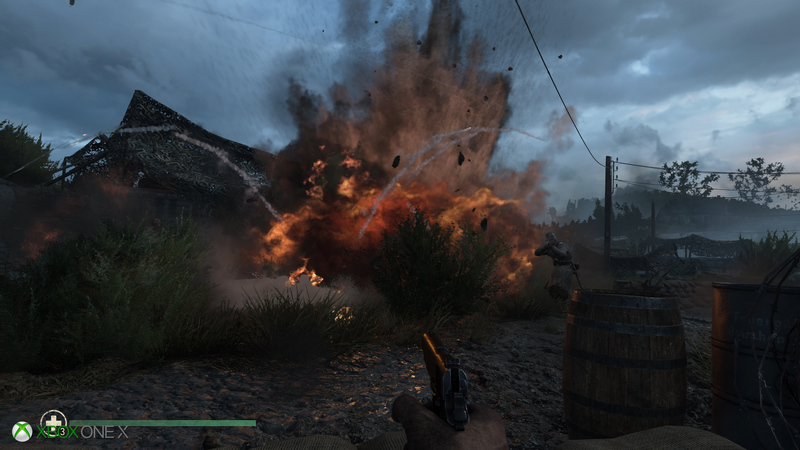 Call of Duty's signature 60fps gameplay is almost entirely locked on every clip we tested. The upscaling strategy pays off handsomely, and there's no evidence of any frame-rate drops on either system caused by an over-taxed GPU. 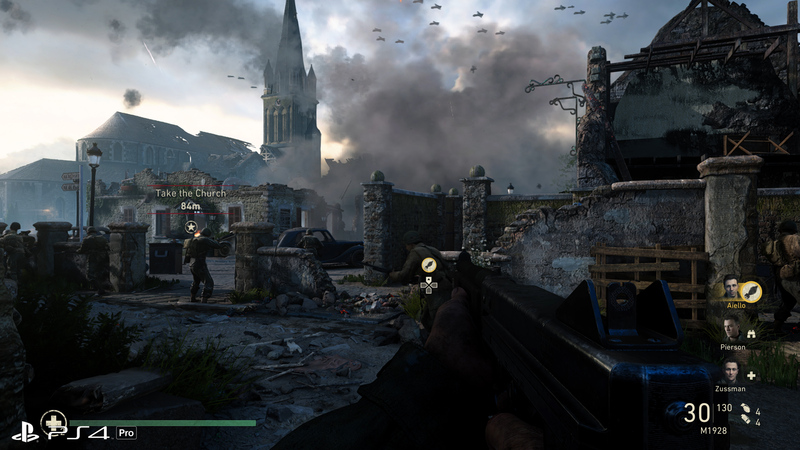 WW2 rolls out its most intensive set-pieces and cutscenes with no impact at all on the slick 60fps refresh. But as smooth and as slick as the majority of the action is, it's not a completely clean bill of health, and the experience is compromised a touch by some occasional, very noticeable stutter. This doesn't seem to be caused by graphics at all (the dynamic scaler doesn't shift during these episodes) and where it happens suggests that the background streaming systems may be having some issues. In order to make the levels as large and as expansive as modern games demand, and to keep initial loading times to a minimum, data is typically streamed and decompressed in the background as you play. 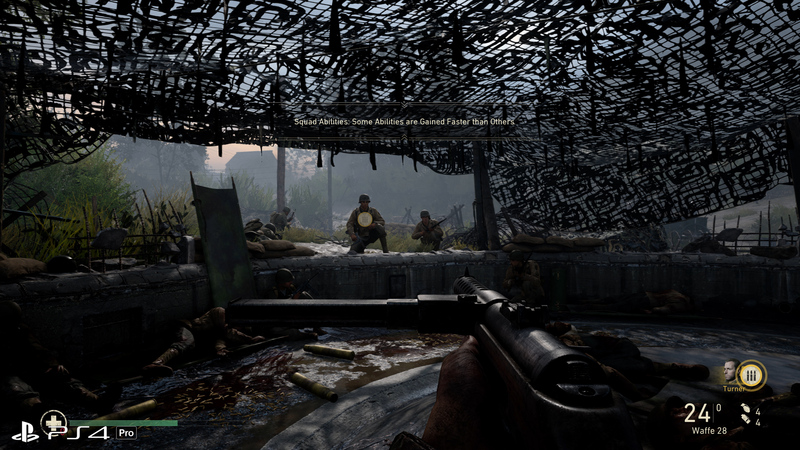 On many games, this can result in momentary pauses - and in WW2, this happens fairly frequently on both PS4 Pro and Xbox One X. It's the one blemish on an otherwise flawless level of performance, and one we hope to see addressed by the developer, along with the curious upscaling artefacts. 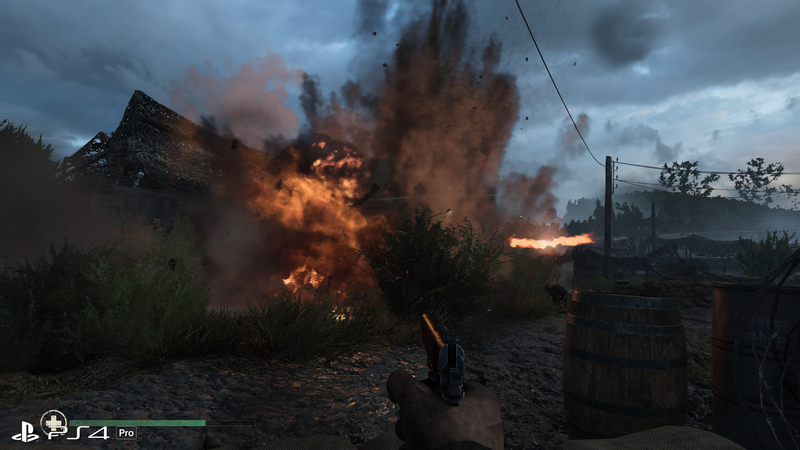 Overall, there's much to commend in Sledgehammer's efforts with the latest Call of Duty. From a technological standpoint, there's the sense that the COD studios continues to push standards onwards, and it's fascinating to see technology working hand-in-hand so closely with the overall design aims of the project. Boots are indeed firmly back on the ground, accompanied by a heavy layer of gritty realism, with a refined engine design aimed squarely at delivering the back-to-basics vision the core users were crying out for. We're going to spend a little more time looking at this title - we're particularly eager to see how PC compares to the premium consoles - and will report back soon. But in the meantime, what's clear is that a consensus seems to be forming across many triple-A engines. Anti-aliasing and super-sampling with a heavy temporal focus is the future, bringing with it clear advantages in allowing multi-platform projects to scale across a wide-range of console hardware. Got one of many mysterious error messages? Here's what Activision suggests to do next.